Do not respond to or donate any money to anyone calling from 240-787-8892 claiming to be from the Fireman's Association. Please report to Law Enforcement as you deem necessary. 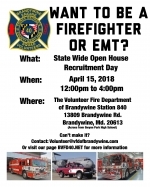 Welcome to the Official Homepage of the Volunteer Fire Department of Brandywine, Inc. We are a part of the Prince George's County Fire and EMS department; the busiest combination fire department (volunteer & career) in the United States of America. 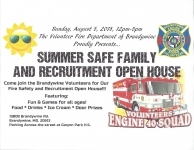 The men and women of this department are proud to serve the Brandywine community, neighboring jurisdictions, and the general public by providing emergency services for fire, heavy rescue, and emergency medical situations. We assist with some non-emergency situations, as well. On September 15, 2015, we began operating from our new home station at 13809 Brandywine Road, Brandywine, MD. Hall Rental: Our Carroll Room social hall located at 14201 Brandywine Road is available to rent for wedding receptions, birthday parties, and other special occasions. For hall rental information, please call our Hot Line at (301) 782-7258 and leave a message for Charlotte Bond, Hall Manager. Please see our Recruitment page at PGVolunteers.org. Attention Race Fans! 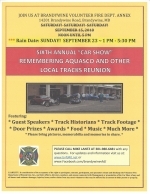 Mark your calendars for our Sixth Annual "Car Show" ~ Remembering Aquasco and Other Local Tracks Reunion! 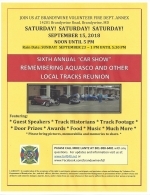 Saturday,September 15, 2018, Noon Until 5 p.m. (Rain Date: September 23, 1 p.m. until 5:30 p.m.) Hope to see you there! 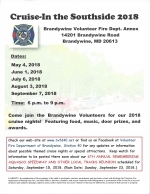 Join the Brandywine Volunteers for our 2018 Cruise nights beginning Friday, May 4, 6-9 p.m. Please see our flyer for this year's dates. Thank you for supporting your local volunteers! This site has been viewed 324,644 times.